I’ve been looking for a way to introduce my seven-year-old to the Greek gods. There’s no shortage of material out there on the subject, but given his age and attention span, it’s hard to find something that can hold his interest. George O’Connor has an amazing series of graphic novels that are full of vivid, spellbinding pictures, but the text is too mature for my son to follow. Clash of the Titans (a perennial favorite in our house) inspired a few questions (“Why did the King put the girl in the box? … Why is Zeus so angry all the time?”), but, given the lack of cartoon characters, he wandered away after the first twenty minutes. Determined to find something appropriate, I stumbled across a real treasure at our local library. 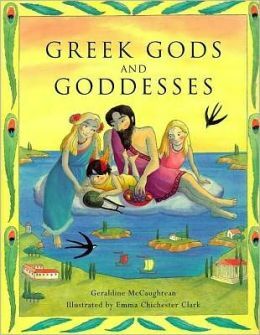 Written by Geraldine McCaughrean and illustrated by Emma Chichester Clark, Greek Gods and Goddesses is a fun and well-crafted book that met all of our needs. The illustrations and stories were child-friendly – meaning that they engaged my son without dumbing down the original myths. The framing of the book is quite clever: Hermes, set with the task of killing hundred-eyed Argus, attempts to lull the monster to sleep by telling him stories. Each story is a classic myth, and each myth is a chapter, making Greek Gods and Goddesses an ideal selection for families to read together. My son and I made it part of his bedtime routine. The chapters are short, leaving time for questions and answers, and with each chapter we got to know another divine character, so that his understanding of the mythos was able to build on itself in a comfortable way. I would definitely recommend this book to other pagan parents -– with a caveat. According to its listing on Amazon.com, Greek Gods and Goddesses is intended for readers over twelve years of age. The prose is a bit heavy for younger kids, but with some theatrics and a little editing on-the-fly, I was able to read it to my son in such a way that he could still follow what was going on.